The price of gold has set another record high, reaching $923 an ounce, after power cuts in South Africa closed mines and fuelled supply fears. The metal was also boosted by the rise in oil prices. New York crude jumped $1.19 a barrel, extending heavy gains on Thursday to trade close to $91. Gold is seen as an attractive investment in times of economic uncertainty and oil-led inflation. 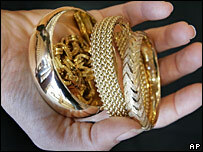 Gold prices increased by more than 30% in 2007 and further gains are forecast. Since the start of the year, the gold price has set a series of records, as many companies have predicted weaker earnings and global lending markets remain troubled. Worries that the dollar will remain weak as a result of further US interest rate cuts are another factor behind the gold rush. JP Morgan analysts forecast in a note to clients that gold could reach between $950 and $975 this year. "Precious metals is a very strong picture," said Graham Birch, head of BlackRock's Natural Resources fund. The rally was exacerbated by the suspension of production at some of the world's biggest gold mines in South Africa, after the country's state power supplier, Eskom, said it could not guarantee supplies. Eskom said the power crisis would last for four weeks, but many observers expect the problems to persist for many years. Is the dollar losing its lustre?